The property formerly housing the ALIVE Center at WKU will soon have a new occupant, thanks to a lease approved Friday (Dec. 14) by the University’s Board of Regents. WKU will lease 1818 US 31W Bypass to The HIVE, a non-profit agency that works with the disabled. The HIVE will pay $500 a month for three years with the option to purchase the property at any time during the term for $250,000. Lease payments will be applied to the purchase. The HIVE plans to work with WKU to create applied learning opportunities for students and expand existing opportunities in Social Work, Nursing and Education. The HIVE also supports the Suzanne Vitale Clinical Education Complex, the Kelly Autism Program and WKU’s Best Buddies chapter. 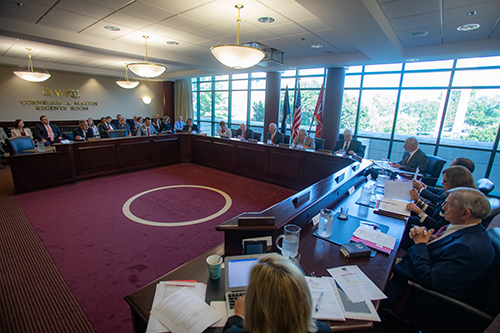 Regents also voted to accept the transfer of property at 1660 Mimosa Alley from the WKU Real Estate Corp. WKU had been leasing the property as a visiting scholar house and will continue to use it for that purpose. Approved naming the Hilltopper Football office suite for Joe and Sunshine Micatrotto, the Men’s Basketball office suite for Steve and Leisa Shirley and the ROTC conference room for Col. Elliott P. “Bud” Sydnor.